It’s the perfect New Year’s Eve outfit, and it accompanied me into 2018 at two parties that I attended with Mr. J. When worn during the day, as seen in these photos, its sparkles dance off the jacket in the sunlight. It’s like wearing a disco ball! It can be worn with jeans, a skirt or in today’s post, black pants that flare at the bottom, revealing my black patent leather boots that possess a shine of their own. As we transition into the new year I am filled with the anticipation of new beginnings, although it’s easy to feel discouraged and overwhelmed by the horrors of the world. I believe that creating peace within energetically affects the universe and those who I connect with in my environment. If only we could live by the Seventh Generation Principle, which is based on an ancient Iroquois philosophy that the decisions we make today should result in a sustainable world seven generations into the future HERE. Where there’s life there is beauty and hope. The rhinestone jacket is accessorized with: black fur felt hat trimmed in rhinestones – Makins Hats, vintage rhinestone earrings, vintage rhinestone clutch and vintage rhinestone trimmed gloves – estate sales, black pants – Buffalo Exchange, and patent leather boots – retail. 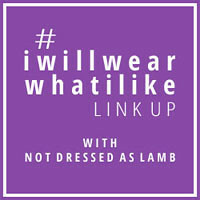 Linking up with Patti’s Visible Monday HERE, Catherine’s #iwillwearwhatilike HERE at Not Dressed As Lamb and Cherie’s Shoe and Tell Fashion Link Up HERE at Style Nudge. Oh my gosh, that is gorgeous!! I love how you’ve styled it here; those earrings are fabulous! The jacket is dazzling – as are you. Love the split-ankle trousers. They look so good. What is the glorious painting or wall in the second picture? And where? Ooh, you look fabulous in bling! That clutch looks like it was made along with the jacket. And, I love the huge strides you’re taking in the video – surely a statement for the coming year. Love the black and gray with your silver hair! You certainly scooped up a treasure here. Love the (typically) perfect coordination! And your beautiful smile sparkles more than all those rhinestones! Happy glittering new year!! Judith, You look snazzy! Great photos. Happy New Year. Love the slit on the pants! As always – about the details. Hi Barbara. We were under a viaduct which had street art for days. It was so much fun! Thanks for your comment! Whoa – that’s SOME jacket! Who wouldn’t want to wear a disco ball?! It must weigh a lot too, which is something I adore in clothing. For me, the weight makes my walk look more sophisticated as I try to hold everything together. Your walk is stellar in that video, although you don’t need heavy clothes to do that, as I’ve seen on your runway footage. Great sparkle welcome to the new year, Judith. Of course I wish you all good things to come in 2018. As you say, where there’s life, there’s beauty and hope. So good. You look so good in this. Lovely jacket. Lovely outfit all together. You started the New Yearin a very good way. Oh I know the joy of having a treasure found in the closet. I have a few things that I have collected over the years that will always be in my closet. Love this jacket and your photos! You look like you’re 10 ft tall with legs a mile long in that video! You always photograph so much taller than you are – it must be the sleek silhouettes you create. That jacket is a party on its own. The dangling rhinestones on the hat and earrings are gorgeous. Love your insights and your beauty – inside and out.